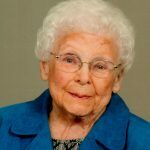 Imogene James, 86, of Mahomet, passed away at 5:20 a.m. on Tuesday, March 19, 2019 in Springfield. Funeral services will be at 10 a.m., Saturday, March 23, 2019 at Mahomet United Methodist Church, 1302 E. South Mahomet Rd., Mahomet. Rev. Craig Sweet will officiate. Burial will be in Grandview Memorial Gardens, Champaign. Visitation will be from 5 to 7 p.m., Friday, March 22, 2019 at the church. Imogene was born in rural Champaign County on August 19, 1932 to Louis and Bessie Dubson Keller. She married Homer Daniel James on February 10, 1951. He preceded her in death. She is survived by her children, Dan (Marla) James of Philo and Mary James of Springfield; granddaughter, Megan (Jared) Bear of Homer; two great-granddaughters, Madelyn and Kensley Bear, both of Homer; sister, Virginia Moore of Mahomet; and many nieces and nephews. She was preceded in death by her parents and two brothers, Robert and Melvin Keller. Imogene graduated from Mahomet-Seymour High School in 1950 and worked at CS Johnson Company in Champaign for many years and at Busey Bank in Mahomet. She was an active member of the Mahomet United Methodist Church and volunteered in the church office for many years. She was also an active member of the American Legion Auxiliary Post 1015. Imogene loved to travel with her family, make her famous coconut cream pies and most of all be Gigi to her great-granddaughters. She will be greatly missed. In lieu of flowers, memorials may be made to Mahomet United Methodist Church or Cornbelt Fire Department. Family and friends are invited to Mahomet Methodist Church after the graveside service for a meal. Online condolences may be made at www.morganmemorialhome.com.